Dr. Barber joined the Department of Mechanical Engineering in 2000. Professor Barber received his B.S., M.S. and Ph.D. degrees in Aeronautical Engineering from New York University in 1964, 1965, and 1968, respectively. In 1968, he joined Pratt & Whitney Aircraft and was responsible for the development of a variety of numerical solvers and associated physical models for the flow in gas turbine engines. In 1983, he joined the United Technologies Research Center, where he was responsible for the development and application of computational analyses for the investigation of fundamental fluid dynamics problems. Dr. Barber has earned three patents for his work in applying enhanced mixing concepts to propulsion system nozzles and fuel cell systems. Dr. Barber taught graduate mechanical engineering courses for more than 30 years at Rensselaer of Hartford. He is an Associate Fellow of AIAA and a member of ASME. 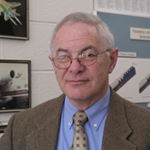 He has served as an Associate Editor of the AIAA Journal for Propulsion and Power.